Barbara Hemphill stated: “Clutter is nothing more than postponed decisions.” It’s funny how everything can take precedence over organising and sorting out our home office. We tell ourselves, there’s work to do, friends to meet and books to read, but an organised office helps with an organised day, which in turn will help you to improve your productivity. Organising yourself and your office starts with discipline and diligence. It’s really not that hard to do, once you make a start. It may feel uncomfortable in the beginning, but good practices always pay off in positive returns. Make the decision right now to become organised and you’re halfway there. 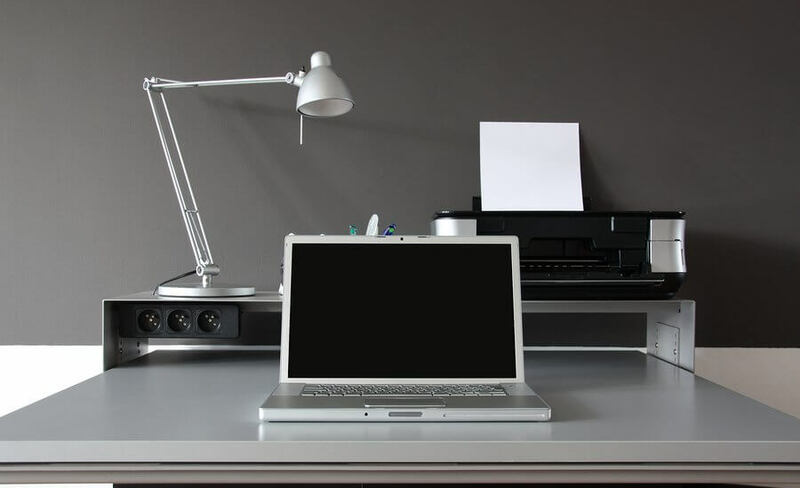 Keep reading to learn more about organising your home office with these handy tips and tricks. When it comes to organisation, plastic containers are one of the best things ever, especially the see-through ones. You can place all kinds of documents, books, papers and files in them and the best thing is that you don’t need to open them up to see what’s inside. If you do like the solid coloured ones, you can place a sticker on them that denotes the contents. It has been proven that clutter has a negative impact on your ability to focus and process information. If your home office is full of clutter, chances are that you’ll get sidetracked by something other than what you should be concentrating on. One way to de-clutter is to make a list of everything that you use in a two week period. At the end of the given time period, throw away or donate the things that fall in the “I might need it one day,” category. After you have decluttered your office, schedule a meeting in your calendar with yourself. This time is allocated only for cleaning and organising your office. Your brain will thank you for it. Everyone has had this experience. You are trying to sound professional over the phone with a client that could potentially put you on the map. S/he gives you a phone number to write down. You pick up your pen and it doesn’t work. You grab the next pen and this one is dry too. You feel yourself blushing as you ask your client to repeat the number for the third time. You can avoid these scenarios by throwing out anything that does not work anymore straight away. Immediately throw away any blunt scissors or used-up pens. Discard paperwork that you won’t require in the future and throw out those magazines from two years ago. Same goes for old newspapers and broken office furniture. Need new office supplies? Find a good source for business supplies and services like Office Depot. In nursery school, we were taught to put things back where they belong. Well, the same goes for your home office. How many times have you looked for the scissors or a paper punch or pen, feeling the irritation rise because the time spent on looking for something could have been spent completing a clients’ assignment? Place every item back in its rightful place and continue practising this habit until it becomes second nature. Get an easy to operate label system and label your shelves, drawers, and trays. This will remind you to put the items back where they belong and assist others to find items that they are looking for. Your filing system should be simple and easy. Let’s face it, very few people like filing and making the process easier will help in saving time. An easy way to keep your filing up to date is to have two trays, labelled TO-DO and FILE. As soon as you have finished with a document and it is ready for filing, place it in your filing tray. Schedule a meeting in your calendar every week, yes, with yourself again, and discipline yourself to use that time for filing and nothing else. You will see that your diligence will pay off. Once your office is sorted out and it’s all organised, you will feel such a sense of pride and joy and be more productive, you’ll wonder why you didn’t do it sooner. Seeing your neat and tidy office will encourage you to keep it that way. As the saying goes, “For every minute spent organising, an hour is earned.” Being organised means that you’ll have more free time to spend on things that you really enjoy, like family, friends and reading a good book.